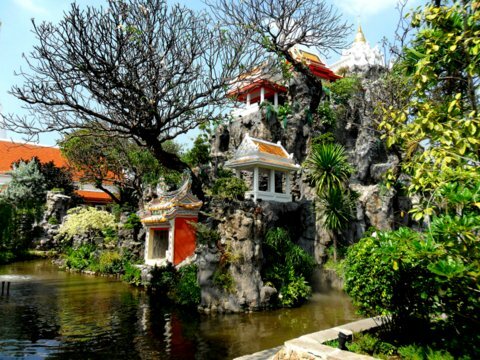 Wat Prayurawongsawas Worawiharn, (pra-yu-ra-wong-sa-wat wo-ra-wi-harn) a Buddhist temple in Thonburi, Bangkok has the distinction of winning the Award of Excellence in the UNESCO Asia-Pacific Heritage Awards for Cultural Heritage Conservation on 9 September 2013. 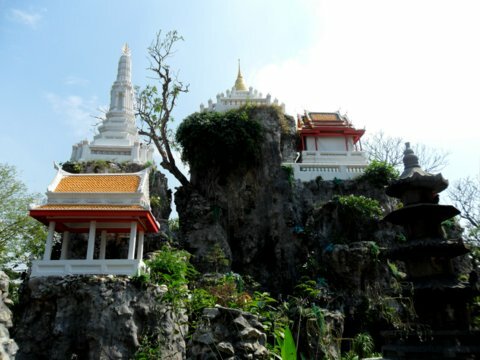 The temple is also called Wat Prayoon and locally Wat Rua Lek (rua – fence lek – iron) and we shall find out later why. 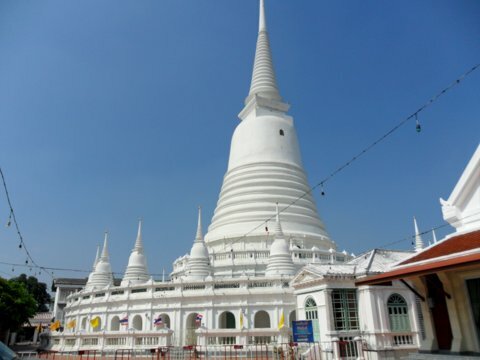 During a local festival in Thonburi in January 2014, a highlight of the festival was the presentation of this Award of Excellence for the restoration of the 60.5m-high chedi in this temple. The temple is a second class royal temple that was built by Somdej Chao Phraya Borom Maha Prayurawong (Dit Bunnag). Construction of this temple commenced in 1828 with the donation of this nobleman’s coffee garden for the temple. The temple wasn’t completed when it was presented to King Rama III who named it Wat Prayurawongsawas. It was Dit Bunnag’s son Chap Phraya Borom Maha Sri Suriyawong (Chuang Bunnag) who completed the temple in 1855 in the reign of King Rama IV. 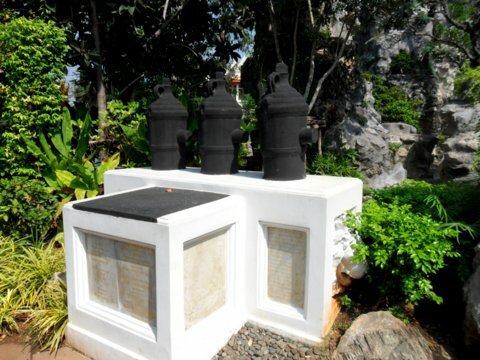 To get there, please see map to Wat Prayurawongsawas. The most striking feature of this temple is the chedi in dazzling white and which can be seen even from the Bangkok bank of the Chao Phraya. The Phra Borommathat chedi is 60.5 m high* and 50 m in diameter at the base. The base has 54 arches with a passage running around the circumference of 162 m. There are 18 smaller chedi around the base. *The chedi at Wat Thammongkol in Soi Sukhumvit 101, Phra Khanong is 94.74 m with 14 stories. 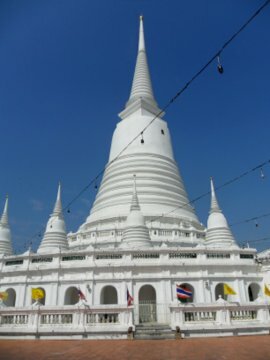 This is the highest chedi in Thailand. In 1871, lightning struck the Phra Borommthat chedi and the damage was only repaired in 1918. Within the crypts in this chedi, numerous old Buddha relics were stored. In 2005, the chedi was found to be tilting by a metre. After technical studies by engineers a major restoration effort was made from 2007 – 2008. Though most of the restoration work was completed during this period, the critical problem of correcting the tilt of the central pillar in the chedi was not resolved until 2010. It was during the restoration that many Buddha relics were discovered inside the chedi. On 5 November 2007 300 Buddha statues were found in the crypts and on 7 November 2007 another 1,000 statues were discovered. The Buddha relics are displayed in the adjoining Parindra Pariyattidharma Sala Building which used to be a public library and renamed Prayoon Bhandakhan Museum. Incidentally the restoration included the museum building and the UNESCO Cultural Heritage Conservation Award covers the museum as well. The museum was officially opened by HRH Crown Princess Sirindhorn on 11 December 2008 on the 180th anniversary of Wat Prayurawongsawas. Please remove your footwear before entering the museum. No photographs are allowed inside the museum. 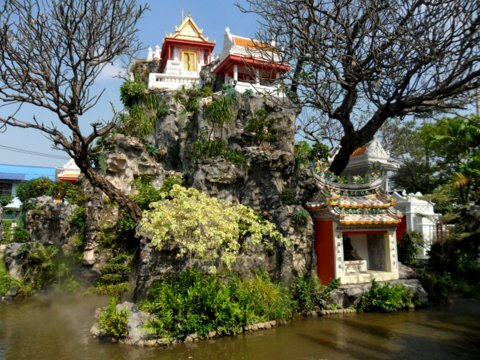 The third attraction in Wat Prayurawongsawas is the rock garden. 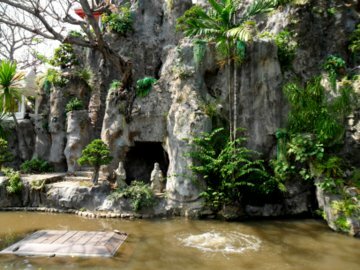 The garden is designed with rocks that appear like a miniature mountain in a lake that’s teeming with turtles, hence the name Turtle Mountain or Khao Mo (Mo is from the Khmer word meaning rock). The rock display is 30 m high, 48 m in length and 42 m wide. The inspiration for this miniature rock mountain came from the idea of molten candle wax piling up to form a mound. 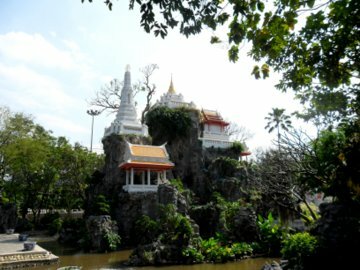 There’s a chedi right on top together with pavilion, shrines and a prang (rectangular pagoda). 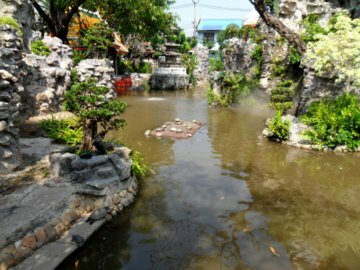 Besides these miniatures, there’s a life-size pavilion for visitors to relax and feed the turtles in the pond. A particular monument in the garden deserves special mention and this is the Three-Cannon Monument. The monument is in memory of those who died in a tragic accident during a celebration in the temple in 1836. Fireworks were inserted in the cannon and lit. Unfortunately one of the cannon barrels exploded when the fireworks ignited. Seven people lost their lives and several lost their limbs. The other feature of the rock garden worth noting is the fence separating the garden from the main road. The design of the fence with the crossed battle-axes appears to be European. For this reason the locals call the temple Wat Rua Lek (Iron Fence Temple). 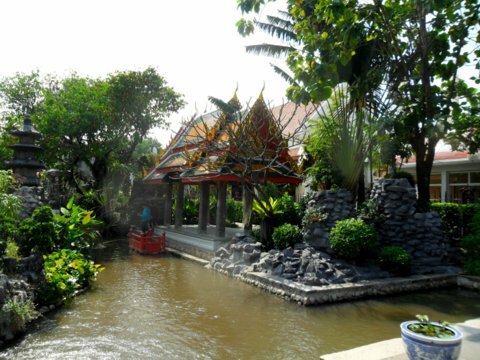 The garden is popular with the local residents who wish to have a peaceful day relaxing in the pavilion feeding the turtles or just strolling around the pond to admire the scenery. Here’s a satellite map of Wat Prayurawongsawas showing the location of these three main attractions. The map below shows the location of the temple on the Thonburi bank and how to get there. Take a skytrain to S6 Taksin Bridge station. Go below the bridge to the Sathorn Pier and board a Chao Phraya river boat to the N6 Memorial Bridge Pier. Cross the bridge and the temple is about 250 m from the Thonburi end of the bridge. The bridge is about 220 m long and all in it’s about 500 m walk. 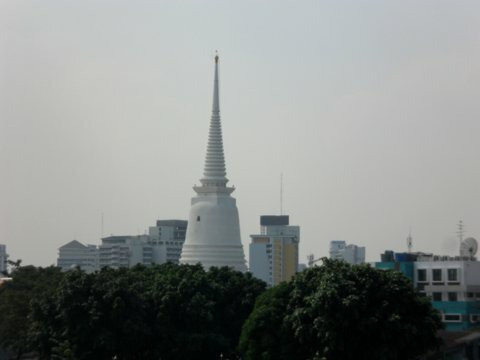 The white chedi can be seen as you are crossing Memorial Bridge. The temple is open every day from 6 am – 6 pm. Admission is free. 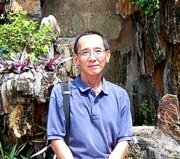 Gaining UNESCO recognition for its conservation efforts is a commendable achievement by Wat Prayurawongsawas. The Buddha images in the museum are also invaluable historical relics. 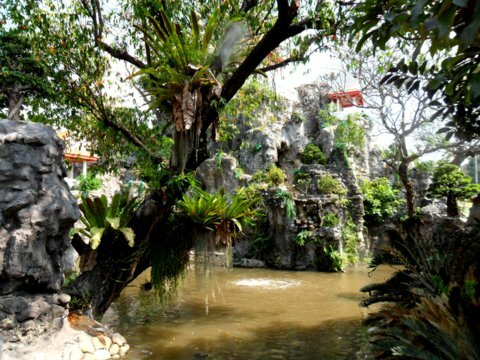 The beautiful rock garden is an oasis of peace and tranquility, a precious sanctuary to seek relief in these troubled times.